once again the seed pod is featuring guest artists for newsletter illustrations. this issue we have talented artist Verlene Brooks (her company is jiggety jig). next issue's was done by 6 year old ben pahls. hope you enjoy em! "Today I bought a wonderful doll!!! She is a beauty, made by Fannie Turgeon She is primitive. Her face is very soiled, which I love. Her eyes and her lips are embroidered, almost crudely. She is very large, and wears real shoes, which were aged. She has stockings, also aged. I just wish you could see her. Her hair is yarn,........well gosh, she doesn't come across as wonderful, but she defiantly is. Her dress is homespun, checked, which the artist used the checks to do a large cross stitch in the bottom of her dress- --some little birds. Her eyebrows are most interesting, She has a place in my heart." "Ok, you asked....here's some info about my open house!!! Last Sunday I had my "Third Annual Craft Open House". This is an event I basically plan for all year....with needle flying and brush flowing! I make up invitations and send them to 100 of my closest friends! The whole week prior to the open house the weatherman promised a beautiful day, I was so excited! The afternoon went perfectly...lots of socializing and lots of purchases. Even the food went over well! I have recipes typed up to accompany each item I serve, for everyone to take home and try. What sold...Christmas stuff and snowmen were very popular again this year. Also fall items and angels. I had some teddy bears and dolls that didn't sell as well as I thought...they'll be saved for the next one! Also signs sold well. All in all, a very successful day...now onto fill orders and get ready for the next show. The trouble is the weather has been so warm and the foliage so absolutely beautiful, all I want to do is go take a walk....haven't learned to sew and walk at the same time yet!" "I have a question about primitives. The dolls I've been making lately are old and worn looking, using lots of old material and found stuff, but I can't make myself put 2 dots for eyes or do stitching. I have to paint a complete face! I just have too, I can't stop myself. I do however, make the painting look old with crackle and antiquing, and sometimes I take a scrub brush to the painting. Would you consider this primitive or just antiquing? I'm not sure what to call my dolls. I guess it doesn't matter as long as I like them. I was just wondering what others thought." "Oh, I definitely dis-agree! For example, on a recent doll I added yellow paint to the varnish for the "skin", it looked great on the flesh parts. Unfortunately, it looked LOUSY on the black-painted shoes and I had to re-paint them. I think that mistakes like an odd pucker in the sewing, lumpy stuffing, features that are painted or embroidered a little askew, and frazzled hairdo add character. For anything else, I like to ask myself if it's the sort of thing that could or would have happened if some person back in 1870, who was basically inept but doing her level best, was the creator of the doll. I always try to remember that she most likely didn't have any patterns for either the doll or its clothing, and simply did what was easiest. She probably wasn't much of an artist, so the face she put on her doll was pretty plain. But ... she made it for love, for someone that was dear to her, and that's probably the most important thing to remember." for adding "wings" to your witch dolls joanie suggests using those black plastic-look fake spider webs. 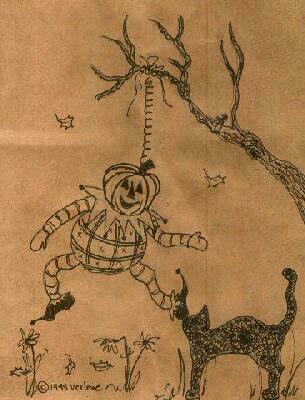 for a doll about 3 ft tall, such as one used for a door ornament, fold a large web in half and tack to the witches back. for smaller witch dolls use the smaller webs, unfolded.